Milling is another word for hard in my books, so finding the best chainsaws for milling is crucial in my opinion. This is a job that will push your equipment to its limits, so you want a chainsaw that can handle the task. If you’re going to be milling you’re going to need to spend top dollar on a quality unit, which can get very expensive. But for your money you will get some of the finest chainsaws on the market, that will power through everything you put in front of it. 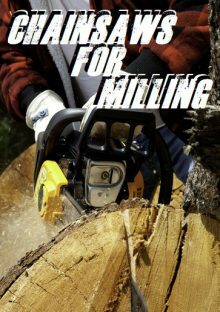 3 Can You Get A Good Milling Chainsaw On A Budget? Finding a chainsaw to use for milling wood is difficult to do. If you pick the wrong saw, you will just end up with a burnt out motor. However, if you pick out the right saw you will be milling wood so much your neighbors may think you opened up a lumber yard. That is why we are going to provide you with the three best affordable chainsaws to use for milling wood. 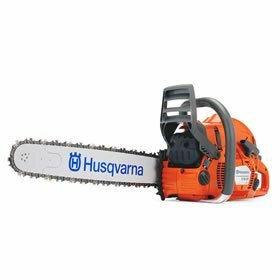 One of the chainsaws that has made the list is made by a reputable company in the Husqvarna 576XP. Some of the key features of this saw is the fact it is going to have a variable length on the bar. The motor will also have plenty of power to use as well as it comes in at a 74cc motor, which is almost as powerful as a small dirt bike. The positives with this saw is the fact the bar can be sized to what you need to have. While this may not seem like that big of a deal, it means you can change out the bar on the mill to handled different wood widths, without having to worry about the safety issues creeping up on you. Something else that is nice with the saw is the powerful motor. When you have a chainsaw and want to use it for milling you need to have a powerful motor to keep it from bogging down. When the motor is completely running and primed it will be one of the most powerful ones on the market and can easily go through the wood you are cutting. One drawback with the saw is the X-torq motor does not have as strong crank bearings that you may be used to when you have used Husqvarna saws in the past. This could easily make it easier for the saw to break down on you, but also means the motor will not last as long as what you would expect. The good news is proper maintenance does wonders at helping to keep this saw going for extended periods of time. Can You Get A Good Milling Chainsaw On A Budget? 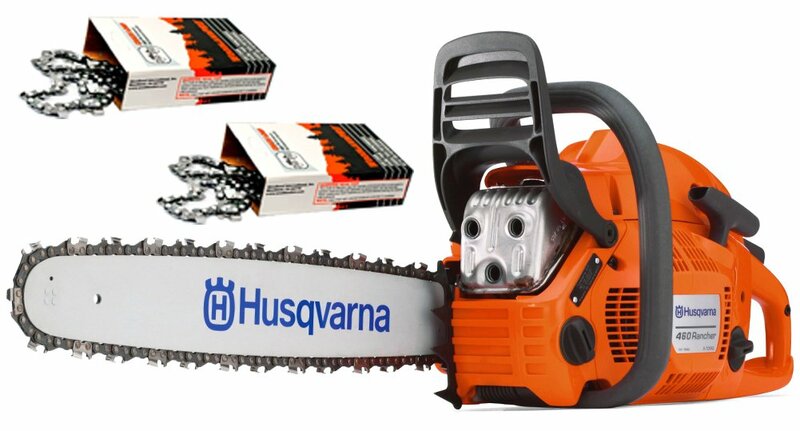 The next saw we are going to mention is another Husqvarna, but it is not from the same line as the original saw. This one is going to be found in what Husqvarna has called the Rancher line. However, you will see the appearance is almost the exact same between this saw and the first one, but you will find quite a few differences as well. The first difference you will notice is the motor size. The Rancher here has a smaller motor and this means less power getting turned into torque for cutting. As far as a positive with the Rancher the first you will notice is the weight. While chainsaws that are going to be used for a milling operation will typically be mounted, it is still important to know how much your saw weighs. This saw is going to come in just at the twelve-pound mark, which will help you in getting the right mount for the saw and not have to be concerned about it tipping over on you. An easy start feature is great for this saw as well. I cannot begin to tell you how many times I have felt like I pulled my shoulder out of socket trying to start my saw. With this model, though, it has a very easy start and this is going to make it easier for you to get the saw running and know it will be ready to go almost as soon as you pull the cord. The amount of power you get from the saw is going to help you out in getting the cutting done quickly. So you will not be spending your entire day cutting the wood you need and seeing you only got halfway through the pile. So the power here will help you get the entire job done quickly and easily. A common issue that we have seen with this saw is the fact the chain break can give you issues at times. This can easily cause the saw to stop working on you all at once, but it is an issue that will not be a major issue for you at times. 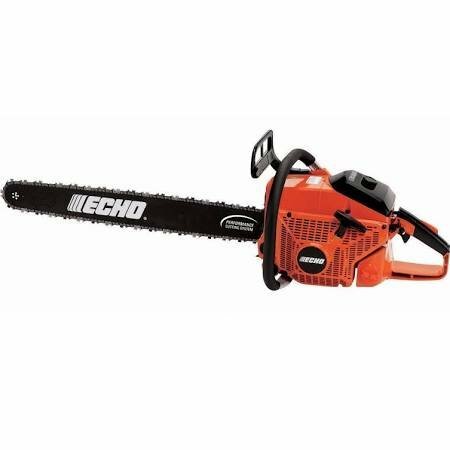 Echo is a brand that is a fairly new player on the chainsaw market compared to Husqvarna or Stihl saws, but they are one that has made quite an impression. The company prides itself on being able to compete against the major companies and this will make it easier for you to have a saw that is affordable, has a lot of power and not be paying for what some would consider the name of the brand. A great thing about this saw is the power level is above the two Husqvarna saws that we talked about above. The power comes in at 81 cc which is an amazing bit of power and often more than enough to get through the wood you are cutting without having to worry about it bogging down. The variable bar length you can mount onto the saw is something else that is very nice as well. You may think that this is going to be a major issue, but you need to realize this makes it easier for you to fit a bar on that will allow you to cut the wood you need and keep the length right. However, a key thing to remember is this also makes it easier for you to change out the bars to one that will keep you safe while using the saw. As for a drawback, the Echo brand itself is one that is not popular as Husqvarna or Stihl or even Poulan. This will make it harder for you to find a dealer that is able to do work on the saw if you need to have any warranty work done on the saw. So this is a drawback on the saw because if it does need work it can be hard to find someone to work on them. Want to go out and find a good chainsaw? It is important to think about your needs, budget, and other relevant information to get something useful. If you are not focused or end up with the wrong chainsaw, this is going to lead to inefficient results. The smart thing to do is to take a look at all of your options and pay attention to everything. Here are some of the most important tips when it comes to choosing a high-quality chainsaw for milling. If you follow these tips, you will end up with a top-tier chainsaw. The first tip for choosing a chainsaw is to take a look at what you are going to be sawing. You want something that can handle the logs you have. This is where you want to take a look at the size of the logs. If you do this, you are going to end up with an appropriate chainsaw for the task at hand. In general, if you are looking to cut a 24″ log, you want to give yourself a bit of room and go with a 24″ chainsaw. This is a good rule to follow as long as you have the money to spend. You can adjust from there. The goal should be to go with the biggest option you can afford as that is the one with the most power on offer. You always want to have power when it comes to chainsaw and too much power is not a concern. You want to go with something that is able to race through the milling process. If you aim for power, you are going to be content with the purchase and that’s what it all comes down to. It is nice to go out and get a huge chainsaw but it is also going to come down to your budget. What are you looking to spend on the chainsaw? Are you ready to spend as much as the best option is priced at? This is a question you are going to be able to answer after setting a proper budget. Take the time to do this so you are not looking at a chainsaw out of your reach. This saves a lot of time. Selecting a chainsaw for milling is all about taking your time to see what is out there. A lot of people invest in a chainsaw that is below par and that is the reason they get frustrated. It is smarter to take a look at all of your options, set a budget, and then make a decision. This is going to simplify the buying process and ensure you end up with a quality chainsaw. If not, you are going to end up with something that is inefficient, weak, or simply too expensive. A good chainsaw can last you a long time so be patient with the buying process. In my opinion you can’t go wrong with any of the chainsaws on this list, they will all do the job. With some of them doing better then the others, but costing a lot more. Which is something that you will have to decide for yourself, if spending that extra amount is worth it? I believe it is better to go with the Husqvarna 576Xp or the Echo CS-800P if you can afford it. As I’ve stated before, milling is the toughest task you will put your chainsaw through and having that power is great. But the Husqvarna 460 rancher also has its strong points, and one of the biggest is it won’t wreck your wallet.